Shake well before use. Use on well - cleansed skin. 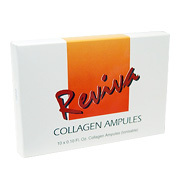 Remember, too, that once - a - week use of Reviva Light Skin Peel is an important cleansing supplement that will further the absorption of ampules. Break off top with tissue wrapped around neck of ampule. Pour into palm and pat or massage lightly onto face and throat. A single ampule is generally used over two nights - just put foil on end of ampule and refrigerate. External Use Only. Water, lyophilized collagen, glycerin, polysorbate 20, propylene glycol, methyl & propyl paraben, diazolidinyl urea. 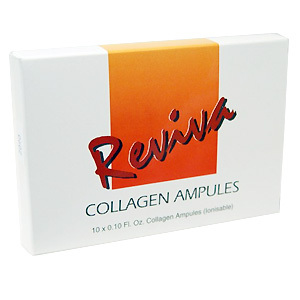 Collagen Ampules is shipped in a discrete, unmarked package. Orders are processed immediately and usually take about 3 to 5 working days to be received. We do ask that you try it for 2 to 3 weeks to feel the full effects. Any information received is used only for order processing and shipping purposes. Your information, such as e-mail address, will never be disclosed to a third party.